A number of studies, which describe the cellular mechanisms and signaling pathways underlying dorsal closure, have pointed towards a mechanical basis for the morphogenetic changes associated with this process. 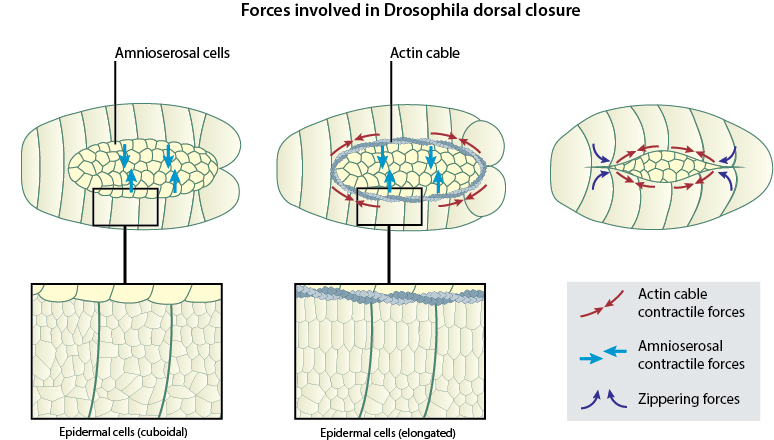 It is now evident that a coordinated interplay of forces generated within the two major cell types involved, the lateral epithelial cells and the amnioserosal cells, is essential for driving the various stages in dorsal closure. These include the contractile forces generated both within the leading edge cells of the lateral epithelium and the squamous epithelial cells of the amnioserosa that promotes the advancement of the leading edges over the amnioserosa. Later in dorsal closure, zippering forces leads to the intertwining of dynamic filopodial protrusions on opposing leading edges in order to form a tight seam at the midline that completely seals the gap . In addition to protrusive forces that favor the forward movement of the leading edge, there also exist counter-acting or opposing forces that are generated by the active spreading of the bulk of the lateral epidermis. The balancing effects of these various forces acting at the interface of the leading edge and the amnioserosal tissue enable the complete closure of the dorsal gap . Within a short time following the onset of dorsal closure, intrinsic tension is generated in the leading edge of the lateral epithelia by the assembly of a supracellular actin cable that contracts like a purse-string . These contractile forces provide structural integrity to the apical surfaces of the leading edge cells and promote their advancement over the amnioserosal cells. Concomitant with the purse-string contraction of the lateral epithelium, the amnioserosal cells also undergo non-synchronous, pulsed contractions at their apical surfaces. Such contractions introduce shape changes into these flat, squamous epithelial cells, as they push the bulk of their cytoplasm into the embryo . This causes a reduction in the surface area of the extra-embryonic amnioserosal tissue and a progressive narrowing down of the gap at the midline. The non-muscle myosin protein, MyoII, plays an essential role in generating contractile forces in both these cell types. While MyoII forms the contractile purse-string in the leading edge cells, it occurs at much lower concentrations in the cortex of both amnioserosal as well as lateral epidermal cells. In mutant Drosophila embryos that lack MyoII heavy chains, the process of closure is completely abolished . Recent studies analyzing force distribution within cells during dorsal closure have put forth a ratcheting mechanism that coordinates the contractions within the lateral epithelial cells and the amnioserosal cells, that drives the forward movement of the leading edge. Real-time fluorescence imaging used to track the position of a fluorescently-labeled apical cell circumference marker has revealed that individual amnioserosal cells start contracting in a pulsatile manner before the onset of dorsal closure. During this stage, the leading edge cells also undergo oscillatory movements, as they get pulled dorsally and then retract back ventrally, synchronous with the pulsatile contractions of the first row of amnioserosal cells immediately surrounding the gap. However, the initiation of dorsal closure is marked by the formation of an actin cable around the apical surfaces of the leading edge cells and the purse-string contractile activity of the cable functions like a ratchet that prevents the ventral relaxation of the leading edge cells, resulting in their net dorsal displacement. As the pulsatile contractions in the first row of amnioserosal cells gets dampened soon after, the ratcheting mechanism acts on the next row of amnioserosal cells and the dorsal movement of the leading edge sequentially progresses towards the center of the gap . The relative significance of each of these independent forces in driving dorsal closure has been thoroughly investigated using laser ablation studies, in which either the actin cable or the amnioserosa are repeatedly laser-cut at various sites in order to release tension from these tissues. Although the mechanical integrity of each of these tissues seemed to be disrupted due to multiple cuts, dorsal closure progressed to completion in both cases, suggesting that neither of the two forces (purse-string vs. amnioserosal contractions) are solely responsible for mediating dorsal closure. However, when both of these tissues were ablated at the same time, dorsal closure was completely abolished. More interestingly, ablations to the lateral epidermis caused the leading edge to rapidly advance over the amnioserosa, as it released the counter-acting forces from the bulk of the lateral epidermis. Such findings reinforce the existence of cellular mechanisms that regulate the magnitude of individual forces and ensure that the closure of the gap progresses normally .